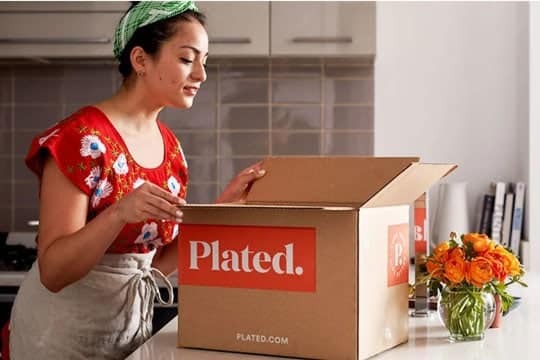 Plated is the most flexible options of the major meal kit delivery services, which offers different choices to design your food box: how often and when they are delivered, which dishes to consume, and the number of serving sizes. They offer unfussy, tasty recipes that are easy to make. Delivery Area: Over 95% of the U.S.
Blue Apron offers chef-designed recipes that include top-rated favorites, quick one-pan dinners and balanced Mediterranean meals. They deliver them in an insulated box and guarantee the freshness of all their ingredients. *Each of the plans can be set up for 2, 3 or 4 meals per week. When you’re looking at a certain meal service, the most important factor is their food offering, so naturally, we are going to take a crack at that category first. Now, if you don’t have a specific diet in your mind and you want to try something different every day, you will probably like Plated. The company offers up to 20 different meals every week – and that includes all of their diet plans. On the other hand Blue Apron has 8 meal offerings per week if go with their Classic Meal Plan and only 4 meals if opt for the Family Meal Plan. Don’t get us wrong, whether you like red meat, seafood, or vegetables, both companies will give you dishes that will suit your taste palette. But like we said, Plated is a unique company on the market, and if you are looking for something more, let us say, exotic, you won’t make a mistake with them. Their meals may take a bit longer to prepare – more on that later – but they are still really rewarding. So for all of you out there that are tired of the same old meals and want some variety on their dinner plates, we would recommend Plated as your number one choice. Unlike the choice of meals, Blue Apron and Plated both offer a huge number of quality ingredients that are picked from local farms. 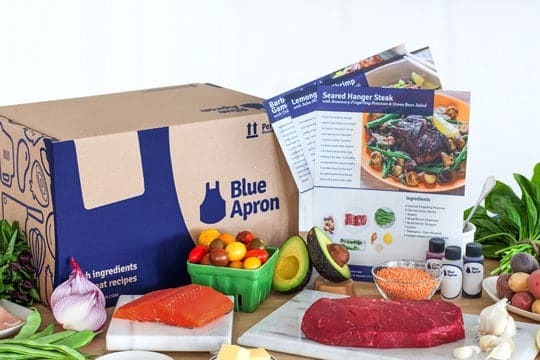 If you’re worried about the meat you’re consuming, you should go with Blue Apron since the company has stated on numerous occasions that all of the meat they use in their meals contains no added hormones and that their seafood is sustainably sourced. But that doesn’t mean that the guys from Plated are slouching in this department. The meat they use is 100% free of antibiotics, their seafood is also sustainably sourced, and their beef has no hormones added whatsoever. Most of the vegetables included in the meals are organic – and that goes for both companies. Looking at the reactions of their customers, both meal delivery services send out delicious recipes, but there’s a slight difference between the two. Most people will agree that Plated offers a little more sophisticated meal options. With both Blue Apron and Plated, you’ll be getting top-quality ingredients and fresh produce coming straight from the local farms. That guarantees that the meals you prepare with them will be as twice as tasty as your standard meals and far more healthier. Blue Apron has worked with independent growers and farmers for years at this point to bring you all of their healthy ingredients. But that’s not all: their team of chefs works close with ranches, farmers, and artisans to create recipes that will highlight the ingredients in the height of the season. Meanwhile, Plated is a company focused on quality, seasonality and sustainability of all of their ingredients. Their main focus is to provide a good balance of healthy and tasty food in their offering, ranging from fiber-filled breakfasts to high-protein lunch meals. Again, making a decision here is pretty though. For all of those that want to help the “little guy” and consume only organic food, Blue Apron is the way to go. However, since most people want to have a good balance of tasty and healthy food, we are going to recommend Plated. With over twenty dishes per week at their disposal, Plated is surely the one who wins in this category. Of course, when we say twenty, we really mean twenty, it doesn’t matter which plan you choose. So you see that Plated offers a wide array of recipes to choose from. All of those recipes are made of high-quality ingredients we already talked about earlier. Again, it is really important to point out that these ingredients are carefully chosen, so the level of quality could remain the same. When it comes to Blue Apron meal service, we already talked about what they can offer. They only offer 12 different recipes a week for both of their plans (8 for Classic Plan, 4 for Family Plan). 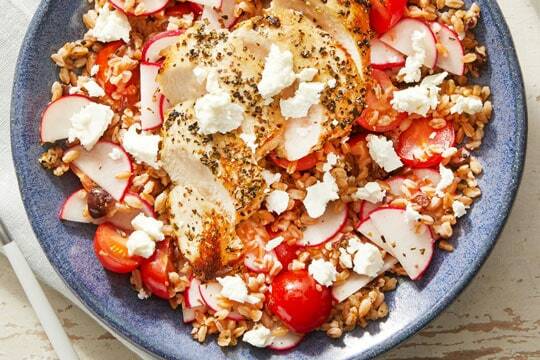 Both Blue Apron`s and Plated`s recipe include fish, meat, fruit, poultry, vegetables, and seafood. Blue Apron policy is that they are offering more traditional dishes, but made with a different approach. Sometimes, you can be very surprised with the result you can get from this. In order to go into details as much as we can, we decided to point out the best meals from both services. We actually took some time to order and taste more than a few dishes. 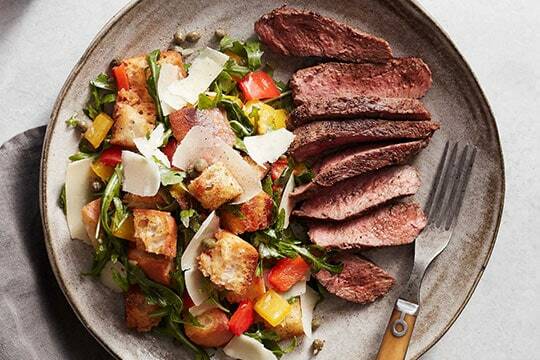 From Plated we need to mention seared steak, shrimp bowls, and moussaka. When it comes to Blue Apron, chicken made with curry and vegetables, parisian steak, and farro salad. As we said, we decided that Plated wins this one, and we would like to elaborate on that a little. From those twenty recipes, you will surely find something that fits your standards or preferences. You can find low calorie meals, meals with high nutritional values, and vegetarian meals. Our opinion that the key to success is diversity. Getting your Plated meal package is very simple. This food service delivers insulated meal boxes that will keep your food fresh up to midnight on your delivery date. They are hand-picked and shipped via FedEx or local couriers, arriving between 8 AM, and 8 PM. Signature is not required. They deliver food to over 95% of the U.S. Convenience and good organization are crucial when it comes to an excellent meal delivery service. This company delivers insulated meal boxes that are eco-friendly. Also, the package includes ice packs that will keep the ingredients fresh for a few hours. Blue Apron delivers nationwide to the contiguous United States. Switching plans – Plated lets their customers to change plans, the number of meals received per week, and the serving sizes. Cancellation – You can skip a delivery week or cancel it at any time on their Account page. But, if you have meal delivery ‘’confirmed’’ when you want to cancel, you won’t be able to do that. You will be billed for the box and receive it. Refunds – You can reach out to the customer service if you are unhappy with any part of your Meal Box. All refund requests must be made within 90 days from the date that you were charged for the underlying Delivery. Gift – You may receive or/and purchase Gift Cards through the App or their site. Free Trial – The Company may offer discounted or free trials for the subscription service, from time to time. These trials will only last for the first week of your Plan. Customizable – You can register, specify your meal preferences, change food plans, select weekly recipes and change your payment method. Switching plans – Blue Apron offers their clients to change or switch their meal plans up for the next week. There is a deadline when a client can do that since the company needs five or six days to prepare and ship the food. Cancellation – You can skip the delivery or cancel it. But any order that is shown as ‘’shipped’’ or ‘’order processed’’ cannot be canceled. Refunds – If you are not satisfied with a meal or some ingredient ordered, the service will replace it at their expense or provide you a partial or full refund of the purchase price. Gift – This meal kit delivery service might offer gift cards from time to time. Free Trial – Blue Apron may also provide free trials of certain subscriptions for a specified time. Customizable – This Company allows their subscribers to choose which dishes which they want more of, which may want to avoid, and which meals they want to change. As you’ve seen, both services have their benefits and drawbacks – Blue Apron may be cheaper but it has less to offer, Plated is more diverse, but at the same time, more expensive. When it’s all said and done, however, we feel that Plated comes out as the clear winner. Although it costs more than Blue Apron, the difference in price is pretty marginal, and the service simply offers benefits that make up for that difference. With better meal options, superior packaging, and more quality ingredients, Plated is a better option for your average home chef that is looking for something that will help them improve their knowledge and sharpen their skills in the kitchen.